I have spent a considerable amount of time trying to find out the history of the Serna company in France. I do understand that Serna was taken over by Repetto years ago, but there is no real clue as to why this company folded. * Repetto does not have a model with the Serna name stamped on it and does not sell a pointe shoe with that name from their official website. 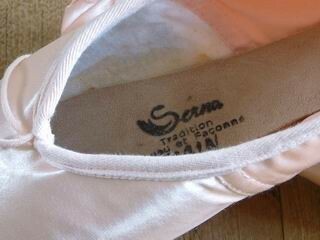 If Repetto took over production of the Serna pointe shoe, where are they sold and under what name? If the Serna models have been discontinued for only 12 years, there should be more information about them than what I have been able to find. These are just a few questions that I have about the mysterious Serna brand. 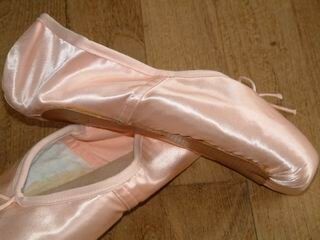 I find the Serna pointe models amazingly pretty and consider it a real shame that they may be discontinued forever. Mysterious, isn’t it? 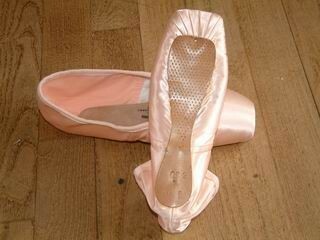 Photo Credit: I would like to thank one of my readers, Jill, for supplying me with these lovely photos of the Serna pointe shoes. This entry was posted in French Brands, Mystery Pointe Shoe Brands and tagged discontinued pointe shoes, French pointe shoes, Serna pointe shoes. Bookmark the permalink.